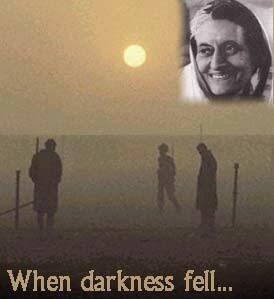 The Emergency, imposed on 26 June 1975 by then Prime Minister Indira Gandhi, ranks as one of Independent India's most infamous incidents. 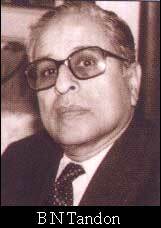 B N Tandon, joint secretary in the Prime Minister's Office [Secretariat], used to maintain a diary of the daily events, and which has now been published as a book. 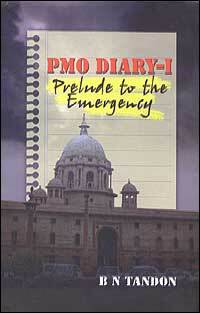 We present excerpts of the events and his comments on the days leading up to the Emergency. This day will go down in history. Bad news began to come in from the morning itself�. VR came to my room as soon as I reached office. I wasn't in a mood to work. The PM had not come to the office. She was awaiting the news from Allahabad. We expected the news to be in around 10.15 am. VR left my room a little before 10 am. He called me at 10.05 and said that the court had decided against the PM but that the news was being confirmed. I immediately went to the PTI/UNI teleprinters, which are situated, between my room and VR's. There I read that Justice Jagmohanlal Sinha had set aside the PM's election and upholding the charges of corruption, he had barred her from contesting any election for six years under section 123(7) of the Representation of the people Act. I started towards Prof Dhar's room. He was hurrying downstairs to go to the PM's house. It was impossible to do any work after that, so I went to Sharada's room where VR was already present. We were all saddened by the news and on our urging Sharada also went off to the PM's house. Seshan and Sharada had also come back from the PM's house by lunchtime. Seshan said that as soon as the news came in ministers began to gather at the PM's house. The PM conferred for a while with Gokhale, Ray and Palkhivala but then started meeting other people. She kept going in and out of the room. But by 10.30 she had had a whispering discussion with Dhawan and Sanjay, after which the former started phoning people around Delhi to organise demonstrations in favour of the PM. The UP [Uttar Pradesh] chief minister was also contacted to send people from the areas around Delhi for the demonstration and to organise one in Lucknow as well. Bansi Lal issued orders from the PM's house that all deputy commissioners in Haryana should help organise these rallies. Then calls were made to say that the rallies should be organised post-haste with a view to demonstrating public support for the PM. The entire administrative machinery of Delhi was pressed into service and very soon rallies began. By lunch the PM had also decided that, since the high court had itself stayed the operation of its order for 20 days and that she would appeal to the supreme court against it, she would not resign immediately� Later, from the description given by Sharada, it was clear that the PM has decided that she would not resign as it would be suicidal to the office. That is why she is not talking directly to the press. After lunch, Ranjan and Salman came to my room and stayed there. We kept going over the same issues and kept making guesses about the future course of events� They all agreed that the PM had committed a major error by not resigning and that her decision was not consistent with democratic norms. She will also come in for a lot of personal criticism. Bhaskar Ghosh came to see me after they left. He told me that as soon as it was announced that the judgement would be delivered on the 12th, the PM asked Ray to come to Delhi a day before. But he came on the 10th night. Ghosh also told me that everyone had advised the PM not to resign and that she was inclined to accept this advice. But at about 5 pm, the PM called Ray and from what she said it looked as though she was considering resigning. (But this was just her phoney style and nothing else.) Ray was very perturbed to hear this and rushed off to the PM's house. There was a meeting of the Congress parliamentary board from 6 pm. GR, VR, Seshan, and Sharda are all of the view that she should not resign. But VR also adds that if the court doesn't grant an absolute stay, she should quit. Prof. Dhar was not sure. He was restless and would come to my room or to VR's but it wasn't possible to discuss anything with him. When he came to my room, some others were present but he did talk to VR. Nothing definite was said but VR thinks that Prof Dhar is in favour of the PM resigning. He is not very happy about all these rallies but is helpless in stopping them. By the evening the Gujarat election results began to come in. The Janata Morcha seems well ahead of the Congress. It looks as if the Congress will be defeated which, in reality, will be the PM's defeat as she has carried the entire burden of the Gujarat elections on her shoulders. When I reached home, Kammi asked me what the PM would do if the supreme court did not grant her an absolute stay. I replied that to the extent that I have been able to understand the PM, she will do anything except quit and that, in order to stay in power, she will not hesitate to use even the most inappropriate means. Kammi didn't like what I said. There was a huge rally at the India Gate in support of the PM today which Sharada attended. According to him nearly a million people had gathered. But other officers who attended said there were fewer people, about 3 or 4 lakhs [300,000 or 400,000]. But everyone is agreed that Delhi has never seen a bigger rally. The PM spoke for about an hour. Sharada said that she spoke very well, presenting the whole issue in a wider context. Some other officers described her speech as poor. According to them she appeared flustered. Government funds and machinery was fully utilised for this rally. But the intelligentsia's question is, what is the connection between the court judgement and public demonstrations? I learnt from Gujral today that Sanjay had given him a severe dressing down because yesterday's rally had not been properly publicised. He was also annoyed that the campaign that is underway in support of the PM too is not getting proper publicity. Gujral was upset that Sanjay should upbraid him. He had been summoned to meet the PM but was asked to meet Sanjay. His meeting today with the PM was also not pleasant. She expressed her dissatisfaction at the inadequacy of the publicity and wanted the proposed demonstration in front of Morarji's house to be properly highlighted. She said that she wanted to see the radio and TV scripts, not just of this but of all news bulletins before they were broadcast. Gujral replied that he too didn't ordinarily see the scripts. The PM then angrily remarked that if he didn't see the scripts why was he the minister for information and broadcasting. She said that whether or not he saw the scripts, the Prime Minister wanted to see them. Later it was learnt that about 20-25 persons had gone to Morarji's house and did some stone-throwing there. But by the time he came out they had all run away. I don't know how much this was publicised by radio and TV. Gujral was pouring his heart out to Seshan and I was quietly listening, thinking that if he is so upset, why does he not resign? The practice adopted by Congress ministers and MPs of not saying anything is what has added to the fear created by the PM. On the one hand, they are scared of telling her the truth; on the other, they keep bemoaning the fact. Nehru's colleagues were never afraid of speaking their minds and he, too, didn't mind when they did. I remember how, during the land acquisition in Ghaziabad, the chief minister of UP, C B Gupta, had written a very frank letter to Nehru and how still more frankly he had spoken to him. That was the only time I met Nehru in his office. Gupta had told him that if he wanted to discuss the matter in detail, he would send me to him. Later, Gian Prakash who is the health secretary now, and I had gone to see Nehru. The late Amir Raza was also present on behalf of the centre. As far as I recall this was in September 1963. In the end, Nehru accepted the basis on which we had been proceeding in determining the compensation. Seshan tells lots of stories like this one. But today, if the PM becomes adamant on something, even her senior colleagues don't have the courage to talk to her about it. Seshan said at lunch that the PM's inner group was busy preparing a plan these days through which demonstrations would be organised in front of the main opposition leaders. He [Prof Dhar] then showed me a note which he had sent to the PM after meeting the president on June 17. It was a very brief note. The opposition leaders had met the president and had put forth two demands. One was that the parliament session be held on time and the other was that the PM should stop misusing the government's broadcasting medium. After the meeting, the president had summoned Prof Dhar to give him a summary of the meeting. This is what he had recorded in the note. The PM had responded with a long minute the gist of which was that the important issue of the day was to ensure that public morale was not dampened. She said that this was why she was addressing the rallyists who came to her residence, to tell them the question was not about any one individual but of maintaining the unity of the country. She further wrote that the opposition was totally wrong in saying that these people were being brought to her house either by force or by the offer of money. It was also being wrongly alleged that Congress workers had burnt an effigy of Justice Sinha or that they had abused the judiciary. She wrote that she had made this clear to the rallyists while addressing them. After reading her minute, I felt that she would not hesitate to use any means to remain in power. I could not find any other interpretation of her minute on Prof. Dhar's note. She seems to have convinced herself that the judgement is not against her but against the people of the country, which is why she thinks it is necessary to keep the peoples' morale up. But how voluntary these rallies are is clear from what is being talked about and what is appearing in the newspapers. To consider yourself a synonym for the people is a clear indicator of dictatorial tendencies. The entire drama or 'swaang' of holding rallies is only to provide validity to her own views. But the basic issue is whether the PM is above the law. She refuses to answer this question, nor is she prepared to face it on principle. The reason for what she is saying now - that neither did her supporters burn Justice Sinha's effigy nor criticised the judiciary - was explained to me by Sharada. When three or four days ago she was talking to some officials about the publicity campaign, her attention was drawn to the fact that by doing all this her supporters could be held guilty of contempt of court and therefore such acts should be stopped. It is since then that she has started saying that her supporters have done nothing wrong. This minute is a crude attempt to create record for the same. What is truly amazing is that in her minute she has not expressed any opinion at all on the demands set forth by the opposition. The monsoon session starts in mid-July and notice is given by the second week of June. This year, this has not been done. It is natural that the MPs, especially from the opposition, should be concerned. Never in the last two decades has there been such a fundamental change in the programmes of parliament as the PM is likely to bring about this year. And she will do it purely for her own personal interest. It is impossible that democracy will not receive a jolt when national and constitutional institutions are tinkered with in this manner. It remains to be seen now what she does to parliament. I have no doubt at all that she cannot face parliament in its current form. No wonder that CR is saying that while the judgement may have established the independence of the judiciary, it might become the reason for the end of Indian democracy. This would be the greatest misfortune to befall the country. But few hope that the PM will act sensibly. She is now convinced that whatever benefits her will also benefit the country. �There were two odd occurrences today. Kishan Chand [lieutenant governor of Delhi] phoned in the afternoon and said that RAX [telephones] should be installed at the residences of Behl and Navin Chawla today itself. He said very innocently that this was necessary in case something happened at night. I didn't argue and told him to speak to Khurana [Sunderlal, home secretary]. The other thing was a phone call from Bhanot who is the acting chief secretary of Rajasthan. He wanted me to make available an air force aircraft for the chief minister, who was away in Dungarpur to attend a wedding in his family but has been called by the PM to Delhi at once. I told him also to speak to Khurana. But why has it become necessary to summon the chief minister so urgently. He can come after a day or two also. I asked Prof. Dhar but he too knew nothing. Last night, Khurana phoned me on the RAX shortly after 1 am. He asked me if I knew of any orders issued by the PM which needed to be carried out immediately. He told me that the LG of Delhi and the chief commissioner of Chandigarh had phoned him. The latter had been given some orders from the PM through the chief minister of Punjab - to arrest the leaders of the opposition. I expressed my ignorance. But when he kept asking, I told him to speak to either the home minister or to [Minister] Om Mehta. I was reminded of what Seshan had said. What he had said s coming out to be true. But the surprising thing is that even though there are to be large-scale arrests, the home secretary has no idea of it. After all, even if they had thought it inadvisable to tell Nirmal Mukherji [former home secretary], they had not bothered to inform even Khurana, who had been appointed because of his 'reliability. When I woke up in the morning Kammi told me that [additional home secretary T C A Srinivardan] Varadan had phoned that I should speak to him. A journalist whom I knew had also called to say that around a hundred opposition leaders had been arrested at night. Only The Statesman and The Hindustan Times had come out, the rest of the newspapers had not been published at all. The same journalist told Kammi that the papers could not come out because the power had been cut off. As I was leaving for the office, Sharada phoned to say, "You must have heard, it is all over. We will talk when you come to the office." He sounded very dejected. On reaching office I went straight to Sharada's room. He told me in detail whatever he knew. Last night the PM had summoned him and Prof Dhar to her house at 10 pm. [Congress leader Devkant] Barooah and Ray were already there. When Prof Dhar and Sharada reached there, the PM told them, "I have decided to declare an Emergency. The president has agreed. I will inform the cabinet tomorrow." Saying this, she handed over the draft of the Emergency proclamation to Prof Dhar. He and Sharada were stunned. They had been summoned only in order to be informed and for their advice on the propaganda to follow. She also told them to prepare a draft of her address to the nation. They were at the PM's house till about 1 am. The cabinet was to meet at 6 am. All those ministers who were in Delhi attended the cabinet meeting. The PM told them what she ha decided to do but not one of them protested, not even faintly. Only Swaran Singh raised some administrative issues. The arrests were not discussed at all. One of the ministers said that he had heard about the arrests but the matter was swept aside. Even Prof Dhar had no idea of these arrests. Sharada said that all the main leaders of the opposition, including JP [Jayaprakash Narayan], Morarji, Charan Singh have been arrested. Sharada also told me that Sanjay was now in full control of the PM's house. After the cabinet meeting he called Gujral to one side and scolded him for the poor propaganda effort. He told him to send every new bulletin to the PM's house henceforth: Gujral told him that from the functional point of view, some official should be deputed for this. He could be stationed at the AIR, where he would be shown all the bulletins. He suggested Sharada's name for this but Sanjay put Behl on the job. VR also joined us. After hearing Sharada he said that henceforth India too would have a "guided" democracy. Sharada said yes in a very low tone. He was very tired. Since June 12 he has had to work the hardest in the PM's secretariat because the PM's entire strategy is based on propaganda. But more than physical tiredness, he was in mental agony. I have never seen him like this. He must surely have wondered if this was what he had gone to jail for in 1942. He is a journalist. After independence this is the first time that pre-censorship has been imposed�. Seshan came very late to the office today and came straightaway to my room. He said, "See I had told you. But I don't know what will happen next. Sanjay has taken control completely." I was very depressed the whole day. I felt very bitter as well. Is democracy coming to an end? I did not stir out of my room. I didn't even go to see Prof Dhar. What was the point? I can understand his pain. I thought that all emergency-related work would be new and I didn't really wish to handle it. I talked to Behl to look after it. After all, he has been brought in not only to look after the additional work but also to gradually take over my work. I kept asking myself how restless Nehru's soul would be today. I have written earlier that no a single minister opposed the Emergency during the cabinet meeting. This is a very serious matter. According to the rules framed under Article 77 of the Constitution, a meeting of the cabinet was necessary before the president could issue a proclamation of Emergency. But these rules also contain a provision that if the prime minister deems it necessary, he or she can take a decision without referring it to cabinet. But the question here is whether a cabinet meeting could not have been held to discuss the Emergency. The decision was taken by the PM alone. Why? The other question is as to why the president accepted the PM's 'advice' under these circumstances. He would not have acted unconstitutionally if he had told the PM that he wanted the advice and opinion of the entire cabinet on this matter. I don't know whether he said this or not but it is clear that this was not what actually happened. Ray was with the PM when she had gone to see the president. They persuaded the president. This is the first time in my knowledge that the president has taken such an important decision on the advice of the prime minister alone. Excerpted from 'PMO Diary -I, Prelude to the Emergency, written by B N Tandon, and published by Konark Publishers Pvt Ltd, Delhi [A-149, Main Vikas Marg, Delhi 110092].